Artists Nicole Bradley and Caleb M. Harris at the Awesome Austin Art Affair Saturday. Soft soul music wafted through South Austin last Saturday afternoon. Residents sat in lawn chairs under the shade of towering trees, sipping lemonade and eating hotdogs, while children played in the blocked-off streets that. It was a block party. 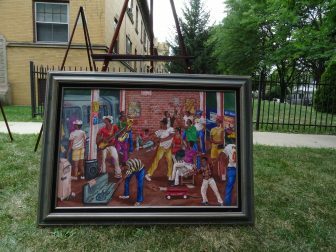 But instead of the regular neighbor gatherings that Chicago summers are known for, this party had a mission. The Awesome Austin Art Affair, held along the 5900 block of West End Avenue, was organized by the Redevelopment Management Resources Inc., a not-for-profit that wants to increase support and visibility for the Austin art community while also giving community members hands-on exposure to the arts. A painting done by Ald. Chris Taliaferro (25th) for the fair. Throughout the nearly eight-hour fair, participants took part in a number of workshops hosted by artists where they were able to take home hand-made jewelry, drawings and more. There were also guided yoga and meditation sessions. Serethea Reid, president of the Central Austin Neighborhood Association and art fair coordinator, said she was pleased with the turnout, and she hopes there’s enough community support for similar events in the future. 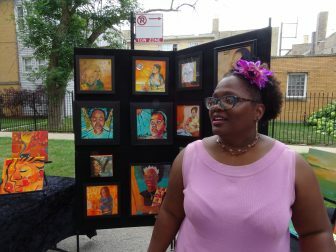 Painter Antonia Ruppert, one of about 10 artists at the fair, said the event is important for young people because they don’t always have exposure to the arts in their own neighborhood or get to meet African-American artists they can relate to. Growing up in Austin, Ruppert said events like the art fair were almost non-existent. Painter Antonia Ruppert stands next to paintings along the 5900 block of West End Avenue. Austin resident and fair attendee Sarah Schriber said that although there are some events similar to the art fair held at Austin Town Hall Park and other West Side locations, there is a need for artistic events in the community. “While there is an art community that is bustling under the surface, there just aren’t many opportunities for these kinds of events since they take coordination, money and time,” Schriber said. Funding for the fair came from a Chicago Fund for Safe and Peaceful Communities grant, one of several grants Reid said she applied for to make the event possible. Reid said she hopes attention and public support from the art fair will help her receive more grants for future events. Brianna Hall, a 9-year-old painter, sold her work for the first time at the art fair. Near the end of the fair, the majority of her pieces had sold. Mixed media artist and Austin native Nicole Bradley said it is important for young African-Americans to see people who look like them working in the arts because it makes them aware that they have the opportunity to enter a creative field instead of pursuing more typical careers. “As a child my creative side was not nurtured as much, so it makes me really happy that kids can see this and know that this can be a real career for them if it is their passion,” Bradley said. See Austin Talk’s previous coverage of the Awesome Austin Art Affair here.